This is a republishing of one of my very first blog posts ever. It remains one of my proudest projects and most popular posts to this day. I’ve updated it with some better pictures to more clearly illustrate how fabulous my impossibly inexpensive curtains really are! Fast, Cheap, and Easy. My three favorite things. Oh wait add pretty. Putting tinfoil on the windows would be faster, cheaper, and easier, but terrible looking. I’ve seen it done. When we bought this house it had very few window treatments. I’m talking a miniblind here or there and that’s about it. And being city folk, we needed some privacy ASAP. In retrospect I should have gone out and bought the cheapest miniblinds I could find, because a year later we’ve still got some bare windows. I don’t do well with projects that can’t be completed in one big push. But in the process I developed a much more efficient way of doing things so you can learn from my mistakes and maybe not spend a year hiding from your neighbors. First I needed fabric, and lots of it. And I needed it to be cheap, and preferably neutral, and easy to wash. To decide how much I needed, I figured two panels per window, nine feet floor to ceiling, times thirty-three (did I mention that this house has 33 windows? ), equals 594 feet, just shy of 200 yards. 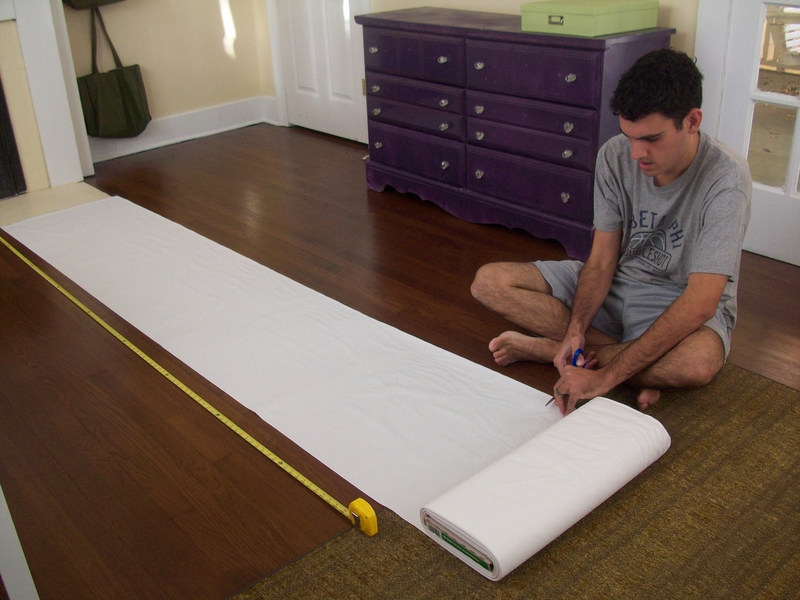 Muslin was the cheapest fabric I could find, so I bought four giant bolts of 36″ wide muslin. That came out to about $7 each for floor to ceiling panels that allow light to come in but are definitely not at all see-through. But my troubles were not yet over. I needed a way to hang these curtains. And if I thought shopping for the curtains themselves had been bad, I had no idea what I was getting into. Curtain hardware is ridiculous! Especially times thrity-three. I spent days scouring the internet before finally finding these and these. They were by far the cheapest thing I’d seen, so I ordered enough for the whole house. When I got them in I realized that the clips were meant to work on a curtain wire and wouldn’t fit the rod, so I bought 300 key rings to join them together. All together I spent about $13 per window on hardware (note that many of the rods were able to serve 2 or even 3 windows. I didn’t need 33 rods). Now for the part where you learn from my mistakes. Once I got everything in my hot little hands, I got started. We decided to hire a handyman to hang all the rods. He charged about $50 I think and it was so worth it for us not-very-handy-people. Leveling, marking, and drilling times all those windows would have taken us forever. Then I started cutting and sewing, cutting and sewing. I thought, wrongly, that if I just worked hard and stayed focused I could knock them out in a week or so. I thought wrong. It was really hard for me to cut nine foot lengths of fabric efficiently. It took fifteen minutes to hem one panel all the way around (that equals 8.25 total hours of my life spent sewing). Then of course the time spent wadding folding that panel up, getting the next panel situated, stopping to complain, etc. I got really discouraged about fifteen panels in, and by then the windows facing the street were covered, and the rest of the time I just tried to avoid doing or wearing anything inappropriate in view of a window through which our neighbors might be able to sneak a peek. I’d get motivated once every few weeks and sew a panel or two, hang them up, marvel at their beauty, then move on with my life. Until I had The Epiphany. The sides don’t need to be hemmed. After washing some freshly-cut panels I noticed that the long sides were never frayed after washing, just the short sides, the ones that I had cut. If I only hemmed the short sides then each panel could now be sewn in about five minutes. This information was revolutionary. I started churning out panels left and right. Curtains in the bedroom! Curtains in the office! Curtains for everyone! Then I ran out of cut panels. But since I was on a roll making things easier on myself I asked Nick for help, and it turns out he’s much better at cutting them than I am. He moved an area rug so that it was exactly 9′ away from a fireplace surround and used the floorboards as a guide to make sure everything was straight, and cut a whole bolt’s worth of fabric in no time. And I’m back in business sewing up a storm and actually making progress. Figure out how much fabric you need. I used two 36″ wide panels on each window (they shrunk a bit in the wash). I wanted floor to ceiling drapes so I planned to cut the panels at 108″ each. The hanging hardware of course makes them hang a bit lower than the very tip top of the wall, but between shrinking in the wash and having the tops and bottoms hemmed it works out about right. Get some muslin. It is so cheap and is available in various widths. This is what I used. If you buy a whole bolt there is sometimes an unsightly seam mixed in somewhere so be sure to buy a little more than you think you’ll need. Figure out how you’ll hang them up. I like clips because it meant not having to sew a pocket and I can take them down to wash them (as if that happens regularly) without taking the rod apart. Again, these rods and clips from Ikea were the cheapest I could find, but I had to use these key rings to make them work together. Cut your fabric. If you have 8′ ceilings and an 8′ rug, you can use that as a template. I tried to use a 36″ wide shelf to measure out one yard at a time and cut every three yards for my 9′ ceilings, but it didn’t work well. Nick’s method of creating placemarkers on the floor and using the floorboards (or a wall) as a guide to keep it straight is the most efficient we’ve found. 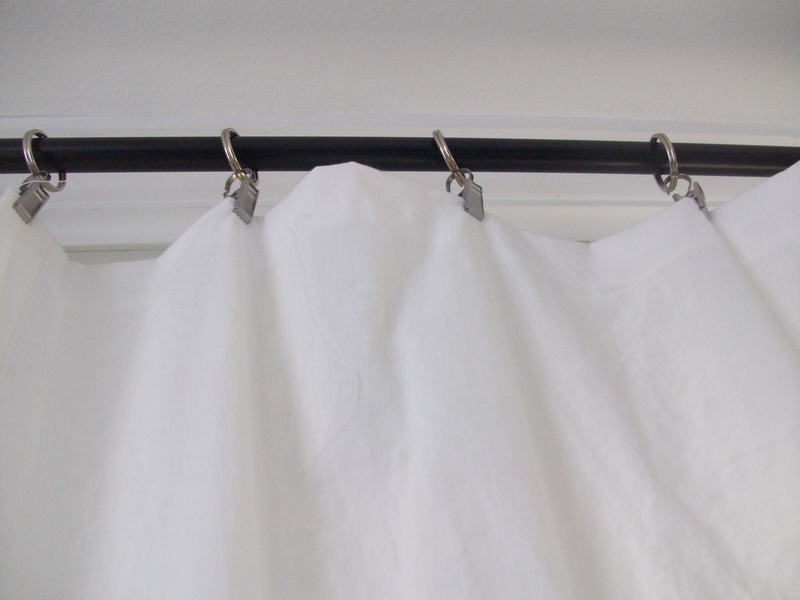 Wash your unhemmed panels the exact same way you would wash them if they were dirty. I use hot water and bleach because I imagine if there’s baby poop on a curtain someday that’s what I’ll want to do. It’s very important to wash before you sew. On my first few panels I sewed and then washed and my stitches puckered up. 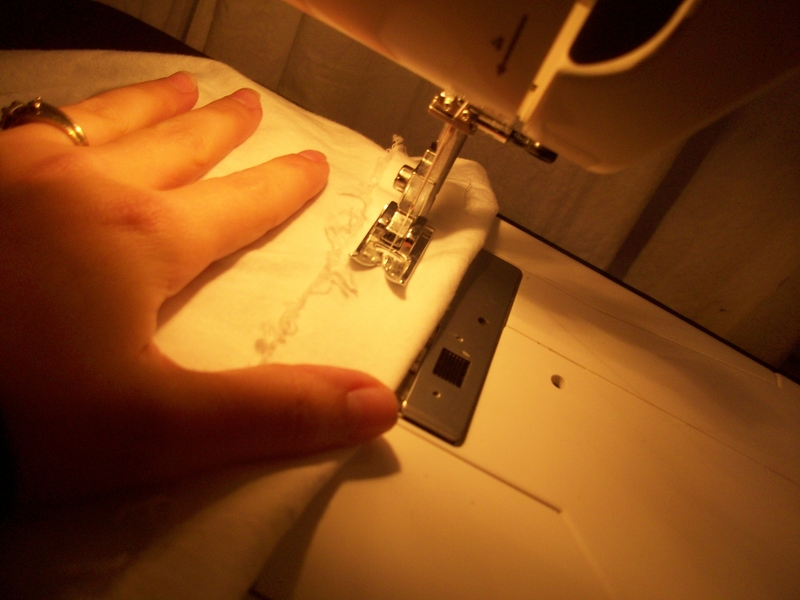 Sew simple hems on the cut edges only. I don’t even worry about keeping it pretty. I fold the edge over once, run it through the sewing machine with white thread, and move on. If you don’t have a sewing machine or have an irrational fear of using yours (as I did for many years), you can use fusible web tape a la Sherry Petersik. Hang em up! I use ten clips per panel and just eyeball how far apart they should go. I get Nick to slide ten rings onto each side of the curtain rod then slip the hooks into the rings and we’re in business. This photo is from where I cheated them to the left in the nursery to create the illusion that the window was centered on the wall (read about that here). I love the how the muslin hangs and that it allows light in without sacrificing privacy, and I think these drapes are just such a simple and classic look. If you need a lot of curtains for not a lot of money this is a great option. What about you, internet? Anyone else find an über-inexpensive method of treating windows that doesn’t skimp on style? P.S….There is one thing I would have done differently. We had our awesome handyman, Andy, or Handy Andy, as I like to call him, hang the rods high and wide like the Petersiks, but for whatever reason the extra wide look just didn’t work for us. Probably because our windows are already pretty generously sized and the panels are too narrow to comfortable cover the window AND an extra foot on each side. So one of these days we’ll adjust all the rods so they’re the width of the window (the rods are adjustable), but for now I just keep the panels pulled to the center and don’t sweat it. You crack me up. Curtains for everyone! Thanks for the tutorial…. your house looks great! Haha, thanks for de-lurking, Mary!